Let’s face it: being a reader can be overwhelming. Each week, upwards of 20 books are released, one sounding just as intriguing as the next. As a way to simplify the book-picking process (very technical term), The New York Times offers up a weekly list of bestsellers, including everything from fiction to nonfiction, and adult to middle-grade. Here are eight New York Times bestsellers from 2018 that you need to read. Children of Blood and Bone, the first book in Tomi Adeyemi’s Legacy of Orisha series, is a 2018 must-read. While it had a generally quiet release, it has since blown up with great critical acclaim and media coverage. The novel takes place in a fantasy world where magic has been eradicated by the monarchy, and follows Zélie Adebola, a young maji, as she tries to bring back magic and avenge the murder of her own mother. Debut author Tara Westover took cues from Jeannette Wall’s 2005 hit memoir The Glass Castle in her own story Educated. Similar to Walls, Westover provides a very detailed and heart-wrenching account of her childhood. Growing up in a survivalist family, Westover never went to school and was forbidden by her father to seek any kind of medical attention, be that a doctor, a nurse or a trip to the hospital. With honest and beautifully-crafted prose, Westover shows readers how she grew into the intelligent and strong woman she is today. Taking its inspiration from the dark history of fairy tales, The Hazel Wood by Melissa Albert is both an atmospheric and eerie tale – perfect for late-night fall reading. The story follows 17-year-old Alice, the granddaughter of a famous, reclusive author of fairy tales who has a cult following. When Alice’s mother goes missing, she and a fellow classmate – who happens to be a fan of the cult fairy tales – will go on an adventure to try to find her. The two may have to venture into Hazel Wood, even though Alice’s mother warned her from ever going back there. Chloe Benjamin’s novel The Immortalists is a quiet and breathtaking musing on grief, death and what it means to truly be alive. Four young siblings meet with a psychic in the hopes of learning their death date. The psychic agrees, but on one condition – each must sit with her privately, and pay a small fee. The story then jumps forward several years, and follows each character around the time of their given death date, showing the different ways information like this can change one’s life. If there is one trend in YA fiction that needs to stay it’s the historical, feminist retellings. Bestselling author Kiersten White serves her fans another remarkable retelling in her newest release, The Dark Descent of Elizabeth Frankenstein. As its title clearly indicates, the novel reimagines Mary Shelley’s 19th-century classic Frankenstein, this time through the eyes of Elizabeth Lavenzo, Victor’s adopted sister. The story – which provides the gothic classic with a much-needed female voice – reaches back into Elizabeth’s own history where she becomes swept up in her own darkness and unrelenting ambition. Ruth Ware has quickly become a household name in psychological thrillers – or ‘grip lit’ – with several award-winning novels, including The Woman in Cabin 10 and The Lying Game. This year, she’s released her fourth book, titled The Death of Mrs. Westaway, which is arguably her most impressive work to date. The book follows Hal, a tarot card reader who accidentally receives a very large inheritance from someone she’s never heard of. Motivated by curiosity, Hal attends the funeral and quickly discovers that the family is full of strange and sinister secrets. Mystery, suspense and historical accuracy come together in Kate Morton’s sixth book, The Clockmaker’s Daughter. The bestselling Australian author continues with her popular split-setting format, following a group of artists in 1862, as well as a young archivist Elodie 150 years later. The book starts when Elodie finds an old leather satchel, containing two very unusual items: a sepia-toned photograph of a beautiful woman and a sketchbook. Curious, because she is oddly familiar with the items, Elodie attempts to uncover the mystery of the girl in the photo – a young woman named Birdie who harbors secrets of her own. Tayari Jones, author of the award-winning novel Silver Sparrow, tackles love, loss and learning in An American Marriage. The story follows Celeste and Roy, a young and successful couple who are torn apart when Roy is wrongfully convicted of a crime and sentenced to 12 years in prison. Five years into his sentence, Roy’s conviction is overturned, and he returns home. By this point, however, Celeste has grown fond of Andre, a childhood friend and the best man at her wedding, and she struggles to reignite the love she once held for her husband. 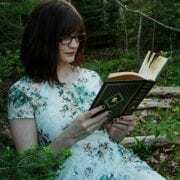 Caitlyn is a writer and bookseller from the east coast of Canada. When she is not reading or writing – which, she admits, isn’t often – she spends her time hanging out with her cat and dog (Harley and Zooey, respectively), or kicking back with a bottle of local cider. Her reading motto is “the creepier the better,” and opts for titles like Shelley’s Frankenstein, Bronte’s Jane Eyre and Du Maurier’s Rebecca. In addition to Gothic classics, Caitlyn also has a soft spot for folklore, with a special interest in fairy tales from around the world.